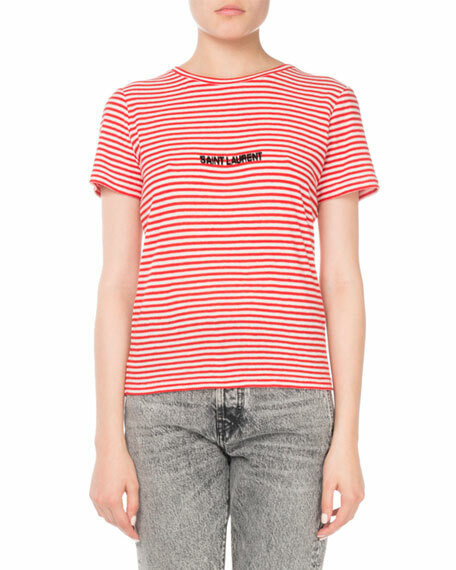 Saint Laurent striped knit tee. ATM Anthony Thomas Melillo jersey "school boy" tee. Crew neckline. Short sleeves. Relaxed, slightly shrunken fit. Straight hem. Pullover style. ATM Anthony Thomas Melillo jersey "school boy" tee. Crew neckline. Short sleeves. Relaxed, slightly shrunken fit. Straight hem. Pullover style. Cotton. Made in Peru. Model's measurements: Height 5'9.5"/176cm, bust 32"/81cm, waist 25"/64cm, hips 36"/91cm, dress size US 2/4. Cinq ?? Sept "Jessa" tee with "What are you waiting for?" statement typographic. Crew neckline. Short sleeves. Relaxed fit. Slipover style. Cotton. Made in USA. Model's measurements: Height 5'10"/177cm, bust 33"/84cm, waist 25.6"/65.2cm, hips 35.8"/91cm, dress size US 2-4/FR 34-36. Frank & Eileen Tee Lab "Core" knit tee. Scoop neckline. Long sleeves. Relaxed fit. Pullover style. Cotton. Made in USA. Frank & Eileen Tee Lab "Core" knit tee. Scoop neckline. Long sleeves. Relaxed fit. Pullover style. Cotton. Made in USA. Model's measurements: Height 5'10"/177cm, bust 33"/84cm, waist 25.6"/65.2cm, hips 35.8"/91cm, dress size US 2-4/FR 34-36. Frank & Eileen Tee Lab vintage-inspired striped tee. Solid scoop neckline. Short sleeves. Relaxed fit. Rounded raw-edge hem. Pullover style. 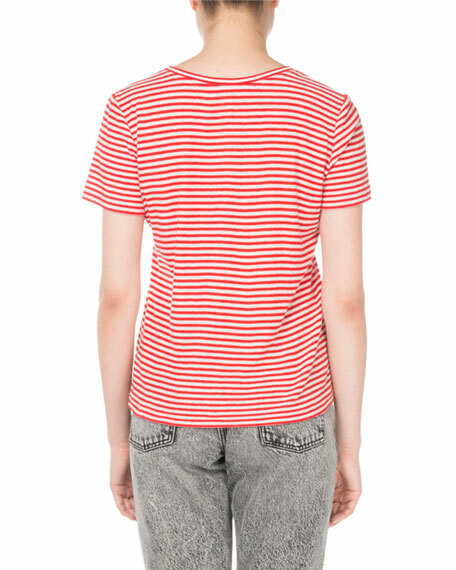 Frank & Eileen Tee Lab vintage-inspired striped tee. Solid scoop neckline. Short sleeves. Relaxed fit. Rounded raw-edge hem. Pullover style. Cotton/polyester. Made in USA. Model's measurements: Height 5'10"/177cm, bust 33"/84cm, waist 25.6"/65.2cm, hips 35.8"/91cm, dress size US 2-4/FR 34-36.